Disney Minnie Mouse Bow-tique Learning Pals Electronic Learning Toys. MINNIE MOUSE. CLUBHOUSE LEARNING PAL. Teaches Colors Numbers And Shapes. MICKEY MOUSE. Just Press A Button And Here Mickey Speak. MICKEY MOUSE. 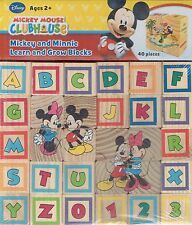 Learn and Grow Blocks also Contain: (4) Puzzles of Your Favorite Disney Characters Learn and Grow Blocks will Help Children Recognize Numbers, Letters, Colors and Shapes. A great interactive toy for children 3 years and older. Step on the piano button and each key plays a note from the musical scale. New Disney Dream Sketcher Mickey Mouse. Electronic Creative Studio. - Use Disney scenes or create your own. - Full color touch screen. - Paint by numbers. Includes USB Cable to connect to computer. The pen (which makes different sounds if the answer is correct or incorrect) was tested and is in perfect working condition. Object Discovery. Disney Junior Mickey Mouse Clubhouse My First Music Fun Books Lot of 4. Super Cheers Music is Everywhere The More We Play Together Super Mousekefriends Check out the other items in my store—I will combine shipping! On the Move. Book is in overall gently used condition. If your child wants to play the piano, just press the piano spot. This item is great for those just learning about music and features the likenesses of Mickey Mouse, Goofy and Donald Duck. New Arrivals. Disney Mickey Mouse Clubhouse, for 3-7 years. Does NOT include standard USB cable. Tested and works great. 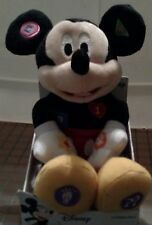 Disney MINNIE MOUSE ,Clubhouse,Learning,Pal,Teaches,Numbers,Colors,NWT 3 Condition is Used. Shipped with USPS First Class Package. What you see in the pictures is what you will be getting. This is a Disney Mickey Mouse interactive learning book. It is in great condition. Picture show it's use.but a pair to share. Haven't been used in long time. (ALPHABET AND NUMBER BLOCKS. IMAGES TO MATCH AND LEARN. LEARN AND GROW BLOCKS WILL HELP CHILDREN RECOGNIZE NUMBERS. COLORS AND SHAPES. LEARN AND GROW BLOCKS ALSO CONTAIN 94) PUZZLES OF YOUR FAVORITE DISNEY CHRACTERS. Hit the drum to create your favorite song. Great Gift for the young rock star. Mickey Mouse Clubhouse Electronic Reader and 8-Book Library : Story Reader ME.... let this electronic reader read to your young children! Perfect for ages 3 and up.Condition is Like new, and still in the box it came in. It just doesn’t have the original plastic that sealed everything in. The box as you can tell from the pictures,is a little beat up. Everything works perfectly, is accounted for, and the books are in perfect condition. It did not give me an option to put Like new in the item details. This comes with 8 books. Thanks! Mickey Mouse Clubhouse, Mickey's My First Learning Book Lights and Sounds (styles may vary). Teaches shapes, numbers and more 5-page story book with electronic lights and sounds. - •5-page story book with electronic lights and sounds. Mickey Mouse Clubhouse, Mickey's My First Learning Book Lights and Sounds (styles may vary). Teaches shapes, numbers and more5-page story book with electronic lights and sounds. (included). Hit the drum to create your favorite song. Great Gift for the young rock star. Three ways to play!